Tags: Adventure, Girl, Grooming, Horse breeding, Horse farm, Horse racing, Money management, Riding, Social, Take care of horses, Train horse. 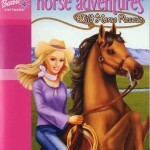 This is an exciting and super fun game for any horse-loving girl. However older kids (11 and up) would probably do better at this game as it requires some understanding of money management, and you are free to chat with other players. The chat rooms are moderated remarkably well, however. When you first sign up, you create a password and username. After reading rules and taking a quiz, you can select your server to start the game. You can subscribe for $5 a month. This gives you lots of excellent benefits. If you don't decide to subscribe; however, you can play for free. Non-subscribers get limited game play at first. You get 1 minute of playing time for every 8 minutes that pass. After you let your time build up a little, you will have hours of playing time. This game has superb graphics, the horse artwork is beautiful, and the little towns are cute. There are several islands in the world, and you can travel across by boat. Most of the islands have little towns with shops and houses you can go inside. You can see other players walking around or riding their horses and you can always stop and chat with them. 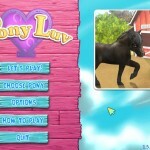 Game play is a little more complicated than most horse games. To get money, you can dig up buried treasure, complete quests for townspeople or sell objects you find to shop owners or other players. 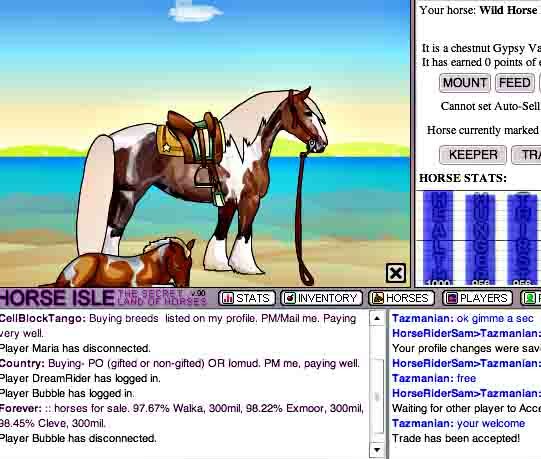 After you have some money, you can buy a horse from the auction or another player. There are tons of breeds and colors of horses to choose from. After you have your horse, you can train it to gain experience points and ride it around for faster transportation. You can enter shows and races with your horse after you have some experience points. The game has lots of fun little mini games inside the big game itself. The only downside to this game really is that you have to pay to get the full benefits. Although a subscription does not cost that much, there are similar games out there for free. This would be a terrific game to learn money management skill for older girls. I love horse isle! Horse isle 2 not so much, but the first and original one is loads of fun! The graphics of the horses when you click on them is amazing. There’s tons of breeds and colors, and you can buy dogs or foals or any other kind of animal as a companion. 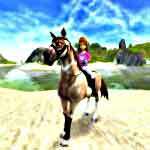 You can train them for jumping, go to several islands to find wild horses, create a ranch, train horses for others, and do a lot of fun quests and SO MUCH more. I play it every day and glad I subscribed. If you play free then you are limited on certain things, but it is only $5.00 a month so who wouldn’t! You won’t regret this game. worst game ever i got so anoyed with it not leting me put any user name in so i just put this jdhbgkvdkjhbvj,nfj and it still didnt dont waste your time reading there lame questions for nohing star stable is 1 million time better! I started playing this game 7 year ago and it has been the funnest game i have ever played. 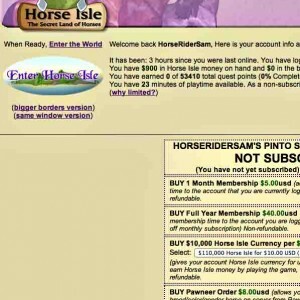 Horse Isle 1 is the best one out of the 2. the video on this site only shows Horse Isle 2 stuff. Try Horse Isle 1 and you wont regret it. Everyone is so nice and there is tons of horses to choose!! If you ask for a horse and tack, someone will give you one and sometimes money with the horse to kick start your game! I love it and will always love it!. Please Join! I’ve been playing this game on and off for 4 years and it’s awesome!! It’s also education and requires you to think as you do quests and minigames. Horse care isn’t really realistuc but you can still pet and feed your horses, and buy special tack and companions for them. One of my favorite parts is that you can still enjoy it without having to pay for a subscription. 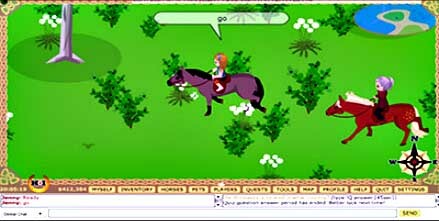 The game looks lame from the graphics, but it’s actually one of the best horse games I’ve played. 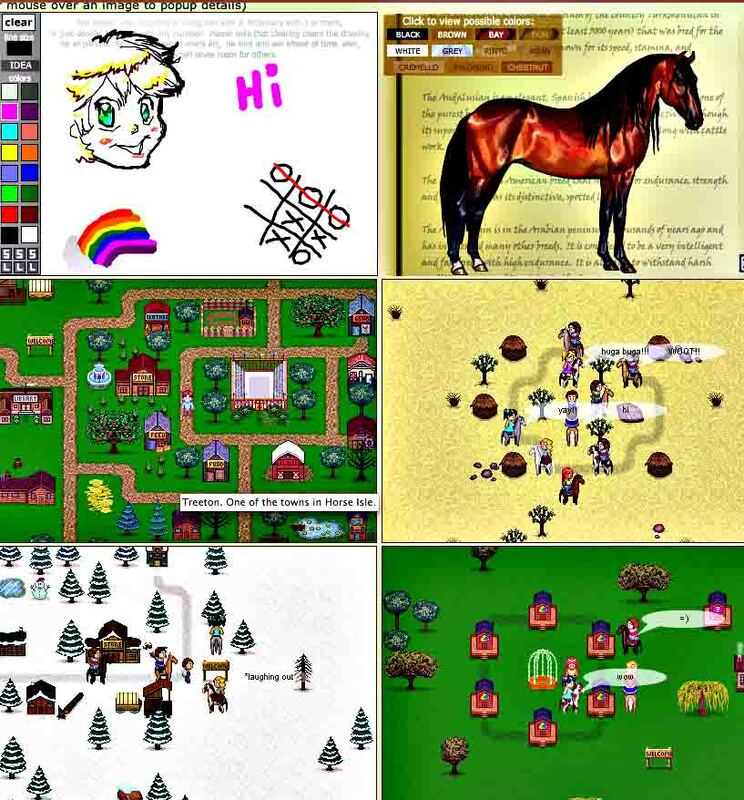 Soooo good for older horse lovers — I’m a teenager, and though I love the nostalgia of many horse games, they’re a little too basic for me. I’ve been off and on it for many years and I still love it. If it gets boring after a month or so of playing, take a break, and come back to it. It will always be fun again! The only disappointment I have is, currently, caring for your horse is not hands-on like it is in many games. You feed it with just a click of the button. I wish you could ride in first-person, and I wish brushing/feeding/tacking up was more hands-on, like in the Pony Club game. Great game. I went onto this site thinking that I probably would like it, and that it wasn’t going to be one of my favorites. I was wrong!! 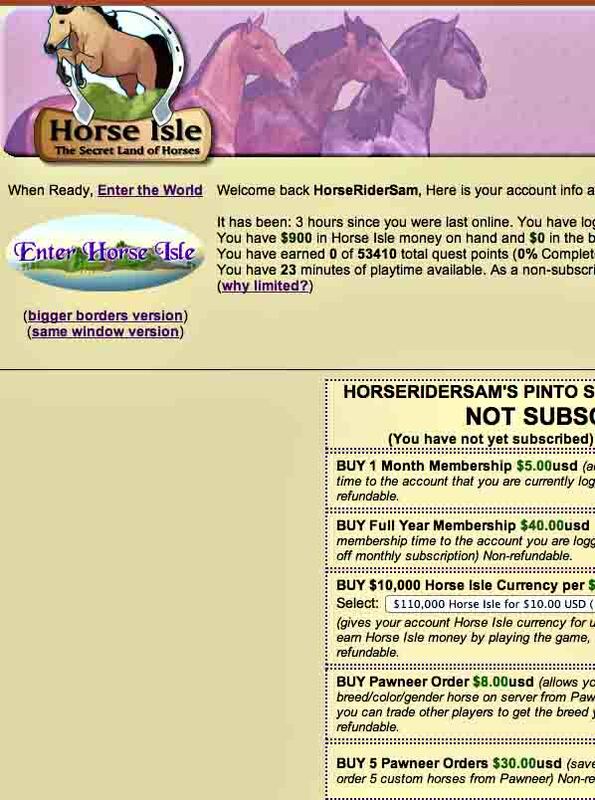 This site is much funner then it looks, and you actually get to ride an horse and do quests!! I got much more then I was expecting from this game, and so far I really like it!